The cigarette giant's income statement has a lot of interesting information. Long-time investors in Altria Group (NYSE:MO) have seen amazing returns over time, and the company's success has been extraordinary even in the face of major challenges. In overcoming legal threats, regulatory hurdles, and a general trend away from smoking, Altria has nevertheless managed to keep its key figures on its income statement moving higher. The five facts discussed below are particularly interesting for those who haven't followed the tobacco company closely. 1. Revenue keeps climbing despite falling sales volume. The long-term secular decline in smoking has led to a steady drop in the sales volume that Altria has managed to sell. Altria had total cigarette shipment volume in the U.S. of 126 billion units in 2015, which was down from more than 169 billion units in 2008. 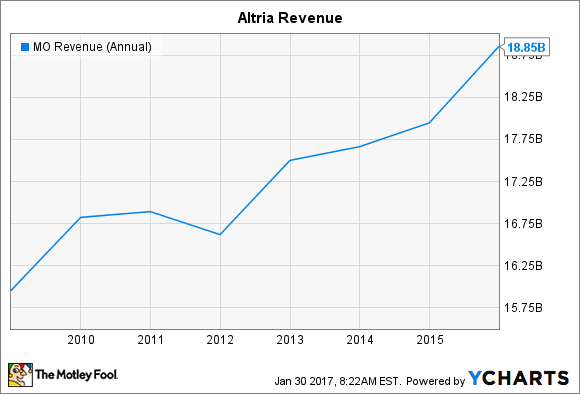 Yet as the chart below shows, Altria manages to keep its revenue moving higher despite those adverse sales trends. MO Revenue (Annual) data by YCharts. Altria's solution has been twofold. First, the company has worked hard to emphasize premium brands like Marlboro over discount brands, ensuring that the maximum amount of revenue per pack of cigarettes comes into Altria's coffers. But second and more importantly, Altria has demonstrated enough loyalty among customers to use pricing power to offset volume declines. The combined impact has been enough to keep the top line moving higher despite smoking's drop in popularity. 2. Profit has rocketed higher. MO Net Income (Annual) data by YCharts. Moreover, when you look at Altria's earnings per share, you'll see an even bigger increase. That's because in addition to its profit growth, Altria has cut its outstanding share count by 120 million shares to 1.96 billion over the past eight years. Add the two together, and you get a nice rise in the bottom line. 3. Operating costs have been under control. Altria has done a good job of keeping its costs in check. In particular, two things stand out on Altria's income statement: cost of goods sold and general and administrative expenses. Over the past eight years, Altria's cost of goods sold has remained nearly unchanged. That stands to reason, given the gradual decline in volume for the tobacco that the company needs to make its key products. Nevertheless, with other commodities having seen substantial price fluctuation over that time period, it's remarkable that Altria has managed to be so successful in keeping costs down. 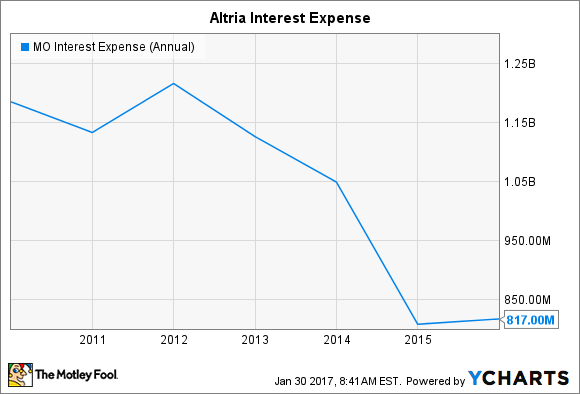 Even more impressive is how Altria has cut its overhead expenses slightly over time. Despite upward pressure on labor costs, as well as the challenges in dealing with sales campaigns and the restrictions under which the tobacco industry operates, Altria has cut its spending by more than $200 million per year since 2009. That has also played a key role in pushing the tobacco giant's earnings higher. 4. Interest expense has fallen dramatically. Like many companies, Altria has benefited from the low interest rate environment. Smart moves to restructure debt have led to a big drop in annual spending on interest, falling from around $1.2 billion just after the financial crisis to just $817 million in 2015. MO Interest Expense (Annual) data by YCharts. Of course, that leaves Altria potentially exposed to any future increase in rates that might come. Yet the tobacco company has taken steps to try to lock in low rates as long as possible, and that should help keep interest expense low in 2017 and for several years to come. 5. Litigation costs have nearly disappeared. Finally, Altria has been the target of plenty of litigation of the years, and the company works hard to defend itself against lawsuits from plaintiffs alleging damages from its products. For the most part, Altria has been able to minimize its expenditures based on litigation, making it relatively inconsequential in its overall operations. In 2015, Altria recorded $150 million in pre-tax charges related to tobacco and health litigation items. That amounted to less than 1% of revenue net of excise taxes, and it was less than 2% of Altria's operating income. Yet the 2015 figure was itself quite high. In the first nine months of 2016, Altria recorded only $88 million in similar charges, and in 2014 and 2013, the amounts were just $44 million and $22 million respectively. For the most part, Altria has shut down opponents in litigation, and that has helped boost profits. Some investors think that looking at accounting statements is boring, but it can also open a window onto a company's business success. For Altria, these fascinating elements of its financial prowess are a big reason why the stock has done so well over time -- and could continue to do so into the future.